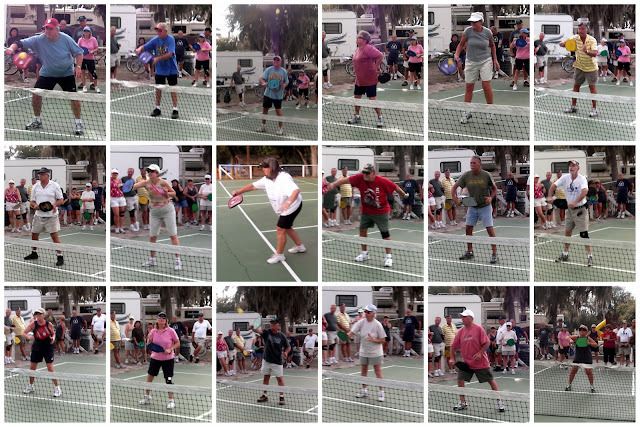 On Saturday, February 18th, twenty-three pickleball players at the Peace River RV Preserve in Wauchula, Fl came out to learn how to improve their game. New Tampa ambassador Rich Donald provided skills/techniques clinic providing training on improving court position, proper grip and serve, dink shots, punch volleys at the net, ground strokes, lobs and the all important third shot! Lots of group participation, lots of practice and lots of questions make for a great pickleball clinic! Below is a group photo. Ambassador Rich Donald on the far right. Many of these players are preparing for the Sarasota Expo, where they will be competing against fellow ELS Parks, Bay Indies in Venice and Harbor Lakes in Punta Gorda on March 6th! Good Luck!! !